Chasb Superior Automotive Refinish Yellow Masking Tape, Combination Box, 1-1/2", 36mmx55M, 3/4" 18mmx55M, 2 sleeve of each size, 36 Rolls. 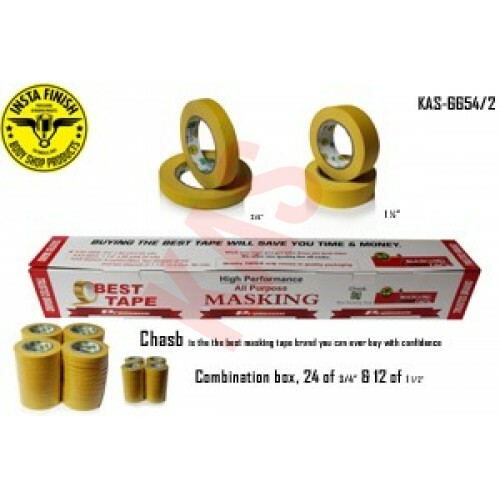 Chasb Yellow Automotive Refinish Masking Tape is designed to meet today's paint technicians requirements for masking before painting; no adhesive transfer; no edge lifting; waterborne paint system compatible. Color Yellow. You get 36 rolls in a special box. No one ever has made packaging like ours, we pioneer the best in what we do. Chasb Automotive Refinish Masking Tape is a yellow crepe paper tape designed specifically for the critical paint masking processes used in the collision repair industry. Proprietary rubber-based adhesive delivers instant adhesion to all vehicle surfaces, has good holding power that allows for a fast and efficient application. The specially-treated paper backing offers solvent and moisture resistance that minimizes bleed through; it also delivers a controlled unwind that makes tape easier to handle. The semi-smooth backing is thin and conformable so it produces sharp clean quality paint jobs. With its balanced construction, the tape sticks stays and removes cleanly. It is an efficient masking tape that helps save time and money.